Eight candidates’ are running for four seats on the Howard County School Board of Education. ALL eight candidates will attend the upcoming BOE Candidates’ Forum at the Other Barn on Monday, October 15th from 7:00 p.m. – 9:00 p.m. In advance of the forum the candidates were asked to answer four questions. 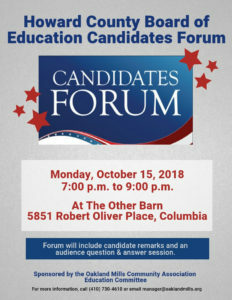 The questions asked and answers from each candidate are posted on the Oakland Mills website (oaklandmills.org) and linked below. The candidates’ responses are printed exactly as they were submitted. Their names are written at the top of each page for easy reference. Responses are listed in alphabetical order. Click HERE to read the four questions asked of each candidate. Click HERE to read the candidate responses to the four questions. The forum’s first hour will provide an opportunity for each candidate to give an introductory statement and provide an expanded commentary on one of the four questions provided to the candidates in advance. The second hour will be time for audience Q & A (questions and answers). Howard County’s Mediation and Conflict Resolution Center will facilitate the forum along with the Oakland Mills Community Association’s Education Committee. For further information email manager@oaklandmills.org or contact Sandy Cederbaum, OM Village Manager at 410-730-4610.